Growing up I really loved Paris Hilton! She was tall, beautiful, skinny & had a unique voice. I know she is famous for being being a hotel heiress & for an obscene video, but hey, after being exposed she handled it graceful by lifting her head and smiling for the camera. She didn’t let it phase her, and because of that — I sort of admired her. She reminded me that I could make stupid mistakes and still be confident. Awesome video right, but look a little carefully– I think I see two, yes TWO, ferrets. I absolutely LOVE playing detective. See you later! How to COPYRIGHT a Photograph! Lately at work I have been dealing with the issue of COPYRIGHTING images. This daunting task, is actually FAIRLY SIMPLE. I’m going to break it down for you—so get excited people!!! Read the instructions on the linked form below — it tells you EXACTLY how to fill it out! Mail in the FORM w/ a $65 check! or FILE IT ONLINE! Fill out the rest of the form the same way! P.S. I am NOT lawyer, nor do I hold myself out to be one. I am just an overly excited law student who loves fashion, food, mainstream culture, Islam, family and friends! 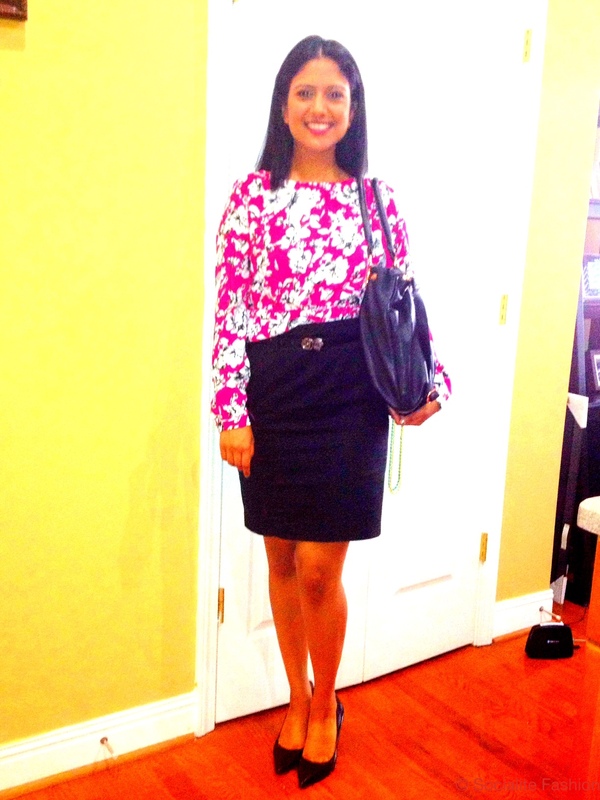 OOTD: First Day of Work! I just started my summer internship at an Entertainment Law practice! The practice has represented entertainment like: Jagged Edge, Arrested Development, Cabbage Patch Kids, The Black Crows, & many more! It’s exciting to be learning about such an “entertaining” field! I would absolutely love to negotiate contracts, on behalf of, people pursing the arts. I think that creativity is the key to any thriving & successful society, and being able to participate in protecting it –is a privilege. My boss emailed told me to dress on the casual side –so I went for business casual. It was the perfect idea. I straightened my hair & parted it down the middle. I really wanted a clean-cut, but feminine look. I’m off to start my first day—- Bye! Organization: Not just applicable to your closet. There is a lot going on in my life at the moment. I have finals to prepare for, personal issues consuming my thoughts, a condo that needs to be organized, and a kitchen that needs to be stocked. Unlike the pleasant Atlanta weather, my life is not so pleasant at the moment. I have had two weeks to reflect on certain circumstances and I have come to the conclusion that: I could be a pessimist, or I can be an optimist, the choice is MINE. I choose to be an optimist, because the bright side, allows me to be more useful with my time, helps me get back on track, puts me in a pleasant mood, and allows me to project my happiness in others, which in turn, allows them to project their happiness upon me. I cannot hide from my issues, or push my issues under a rug, but I can delegate the mental stress I devote to each issue and the order I decide to stress about each particular issue. So for example, my second year final exams are my first priorities. Second, When I get spare time, I should go grocery shopping, stock my fridge. Third, I need clean my apartment. I do not need to do an IMPECCABLE job, but I do need to clear the sink, wipe down my counters. After attacking these issues, and after my exams are over, I will stress about issues that will affect my mood & things that if dealt with right now, would cause me to devote less than 100% towards studying for my exams. After my exams are done, I will tackle them, surfacing/dealing with them now, will seriously just be a waste of time, and could potentially jeopardize my ability to perform well on my finals. I hope you are not dealing with anything to serious, but if you are — remember choose to be an optimist. Delegate your time accordingly. Only love those that love you, and try to put on a fake smile, even if you feel like this is the WORST DAY EVER. It will get better, and smiling is the first step — I promise. There is an incredible amount of stuff on copyright infringement on the internet. There is so much stuff on the subject that the sheer amount makes me want to gamble with my luck and use my own moral compass. Unfortunately, following my own moral compass is a ridiculuously bad idea (I have law school to thank for this redirection). I was thinking about doing a series for the beauty vlogger and blogger about their blogs/vlogs and making sure they comply with the law. Paying attention to the copyright laws is such an important aspect of running a successful blog/vlog. It is important, since most of you bloggers and vloggers would love to make blogging a full time job (which trust me it can be — I have a brother successfully conducting in the affair). Although, not being educated on copyright law (17 U.S.C. §106) & fair use (17 U.S.C. §107) at the beginning is okay (I’m not saying this in a positive way), since you probably only have a few viewers or a few hundred viewers– I suggest you familiarize with the law sooner than later. As your blog/vlog attains popularity and starts developing into your “cash cow,” others will not be amused by your ability to use their work to make you money. Sooner or later you will either be fined by the company or forced to entertain a lawsuit (which is extremely expensive way of dealing with an issues). I will start the series next week. Do you have any specific questions? I would love to focus the blog pieces around areas you’re interested in. Remember, this piece and other pieces are my own opinions, and I’m not a lawyer nor am I holding myself out to be lawyer! I am simply a law student, who is obsessed with social media!